In addition to the basic information above, below are answers to some frequently asked questions about the Swing Shift Shuffle radio show. Who are you? My name is Tim Taylor, and I am the host (a/k/a "Shift Leadman and Union Shop Steward") of the Swing Shift Shuffle. I first came to WEVL as a listener, then a member, and then a substitute programmer, filling in when regular programmers were out. In that capacity I substituted on a wide variety of WEVL shows covering a range of musical genres, including bluegrass, Celtic, French music, Indian music, jazz, rockabilly, contemporary singer-songwriter and finally swing. What is WEVL? WEVL Memphis (89.9 FM/wevl.org) is a nonprofit, noncommercial, independent, listener-supported, volunteer radio station. WEVL does not sell air time for advertising, and it is not associated with any other entity. The station receives the overwhelming majority of operating funds from listeners who become members of the station. A donation of $40 or more is all it takes to become a member. The station has only 3 paid employees, 2 full time, 1 part time. Otherwise, volunteers provide most of the on-air and off-air labor for WEVL. The volunteer programmers are members of the community who donate their time, energy, knowledge and music to provide listeners with the diverse range of music for which WEVL is known. For more about WEVL, visit wevl.org. Why did you choose the hard-to-say name? Well, Swing Shift seemed a bit obvious, and just a little research revealed that there was already a swing radio show with that name. Inspired by the title of the Tex Avery cartoon, Swing Shift Cinderella, I went looking for another word to add some rhythm to the name. I settled on "Shuffle" for its alliterative quality and double meaning: a dance, and a feature on CD/mp3 players that creates a mix of songs from a variety of artists. It was only after I chose the name that I discovered some other interesting facts. There was actually a song from the 1930's called "Swing Shift Shuffle." As yet, I have not been able to find a recording of it, but I keep looking. 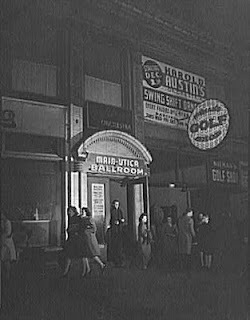 In addition, at the beginning of World War II, American war workers who worked the "swing shift" missed many of the after hours social activities enjoyed by employees who worked the other shifts. To remedy this problem, the USO planned special events for swing shift workers during their off hours, such as movies, sports events, games and dances. Although I have yet to find any conclusive proof, I'll wager that at least one of those dances was called the "Swing Shift Shuffle." What is a "swing shift"? The "swing shift" is one of the shifts at a company that operates twenty-four hours a day. The swing shift occurs between or overlaps the day and night shifts, usually between 4:00 p.m. and midnight. What is the opening theme music? The Shuffle's opening theme is "Powerhouse," written by Raymond Scott, and performed by Bert Ambrose and his Orchestra, a British swing band of the era. If the tune sounds familiar, it is because that piece, along with over twenty other Scott compositions, was regularly featured in Warner Brothers cartoons beginning in 1943. The irony is that Raymond Scott did not write that music, which has since become synonymous with those classic cartoons, for cartoons. He just wrote it. He did not even watch cartoons. What type and era of music do you play? I play swing, big band, jazz, boogie woogie and other popular music from the two decades between 1930 and 1950, with only the rarest digression into the late 1920s, early 1950s or contemporary swing. Where do you get this music? Most retail new music stores have only a fair-to-moderate selection of good swing era CDs, so the internet proves useful. One of the best places to start is emusic.com, which has a large selection of swing/big band/jazz available for download. For CDs, CDUniverse.com, Amazon.com and Overstock.com have a wide variety of this music, and all have been sources of my collection. I also have found great deals at used music stores and flea markets. What is a "V Disc?" A "V Disc" was a record produced during World War II under a special arrangement between the U.S. military, record companies, and musicians. In the early 1940's, the musicians' union was on strike against the record companies in a dispute regarding royalties for jukebox play, so popular artists were not recording any new records. In October 1943, Lieutenant George Vincent, a recording pioneer in civilian life, convinced the musicians' union to allow its members to record sides for the military, as long as the records were not offered for sale in the U.S. The "V Disc" (V for Victory) was born. The artists now had the ability to record music, and a receptive audience in the soldiers, sailors, marines and airmen who longed to hear the music of home. Since the records were for government use, V Discs often feature combinations and collaborations of artists who were under contract to competing record labels. After the war, the records were supposed to be destroyed, but fortunately for us, some servicemen managed to smuggle them home, risking prison to do so. Now, many V Disc compilations are commercially available. Who are some of your favorite artists? The usual suspects on any "swing" or "big band" compilation, Count Basie, the Dorseys, Benny Goodman, Duke Ellington, Harry James, Glenn Miller, etc., are there for a reason. They were (and still are) some of the most popular and prolific musicians of the era. Nowadays, they are often generally associated with a few signature tunes, but some of their best work is frequently omitted from the generic compilations. Some other interesting, if lesser known bandleaders (at least today) include Bunny Berigan, Cab Calloway, and Memphis' own Jimmie Lunceford. For vocal harmony enthusiasts, check out the great sounds of the Mills Brothers, the Four Vagabonds or the Spirits of Rhythm. Hoagy Carmichael and Ella Fitzgerald top my male/female vocalist list. Finally, no one can match the string dominated "Gypsy swing" style of Django Reinhardt and the Hot Club Quintet of France. What is the rhyme at the end of each show? "Verse by the side of the road." The rhymes are from advertising signs used by Burma Shave from the 1920s-50s. Each line of these rhymes appeared on a separate sign, and the signs would be posted at intervals along rural highways (before interstates). You read each line as you drove along, before reaching the punchline at the fourth or fifth sign, followed by the words "Burma Shave" on the final sign. Most of the rhymes were humorous ads for the brushless shaving cream, but many were safety reminders for the motorists of the day. A few folks have asked why I do not complete the rhyme with "Burma Shave" as the signs read. Believe it or not, Burma Shave products are still available for purchase. Repeated mention of the Burma Shave name could easily be interpreted as promotion of a for-profit product, which is inconsistent with WEVL's noncommercial status. Spring Pledge Drive Special: Happy 100th!